Did you say “Rabbit” this morning? But for realz, did you? I did. 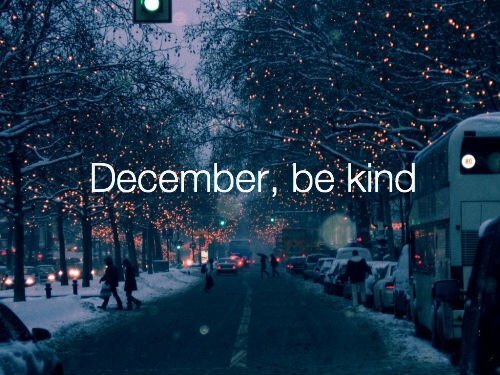 Good luck for the entire month of December, yo. Dang, November seems to have flown by yet it slowly dragged on at the same time. November was good to me, I have to say. There is much to be thankful for. I traded in a job I hated for one that I am in love with after only working there for 4 days. I have my own cubicle, phone, and name plaque–big victories here. I get to write all day every day in a quiet little haven. I was marveling today at the amount of things that can change in just one month. I thought my sister wasn’t going to be able to come home for Thanksgiving, but she surprised us all by showing up, making it the best weekend in a long time. Time to get full on into the holiday festivities. I’m thinking about doing a December blogging challenge. My last challenge got me almost 20 new followers–small victories. So happy December, here is the first post of the challenge! 1. Work on my posture — random, but I always catch myself slouching. My back is messed up enough as it is. So I’m going to make a habit out of sitting up straight. Feel free to punch me if you see me slouching. 2. My fitness focus for the month is going to be yoga. Yoga sculpt is my thing, but the classes I liked to go to now conflict with my work schedule most days. I decided I can’t use that as an excuse anymore and am going to make a point to go twice a week. ALSO, they do yoga at my work during lunch on Tuesdays and Thursdays so that’s pretty cool– gotta make new friends somehow. 3. Finish all 4 of the books I have started right now. This is getting ridiculous. 4. Make one more drastic change. I’m up to 5 drastic changes and I need just one more before the end of the month. TBD. I will hopefully have a surprise guest blogger in the next few days here so that will be interesting. Oh P.S. Parachute and Mat Kearney at the State Theater on St. Patrick’s Day… tickets go on sale this Friday! December is already brining great things.